The kids are going back to school next week and it’s starting to feel like the end of summer. The fact that a tropical storm/hurricane is scheduled to make landfall tomorrow drives home the point that the lazy summer days are fleeting. But before summer truly ends and the floodwaters come, let’s enjoy some fresh sweet corn while we can. 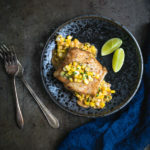 The corn in this recipe is inspired by esquites, the Mexican-style street corn that is generally corn kernels sautéed with onions and topped with mayonnaise, cotija cheese, lime juice, and chili powder. My version takes the rich, tangy, and smokey goodness of esquites and makes it into a creamier version that works great with almost any protein. I chose fish to keep the meal light but I think this would work great with some seared chicken cutlets or firm tofu too. Granted, this version is far from authentic – it replaces the mayonnaise with cream, uses smoked paprika instead of chili powder, and has no cheese but after my last failed attempts at trying to replicate Mexican-style street corn as a sauce, I decided that cream really is the better option and the cheese wasn’t necessary. The paprika adds smokey flavor without being spicy. Sorry to cut this post short but I have to go do some hurricane prep and get this post published since there’s a chance I may have no electricity tomorrow. Hopefully, things will be back to normal next week. Generously season the fish fillets with salt and pepper. In a large nonstick skillet, heat butter and olive oil over medium-high heat. Add the fish fillets and cook, turning once, until fish is browned on both sides and just cooked through, 6 to 8 minutes total. Transfer the fish to a plate and cover with aluminum foil. Set aside. Heat the pan again over medium-high heat, add green onions and corn kernels and toss to combine, scraping up any browned bits from the bottom of the pan with a spatula. Spread the mixture into an even layer in the pan and let cook without moving until lightly browned on one side, about 2 minutes. Toss corn, stir, and repeat until corn is just tender. Reduce heat to medium and stir in cream. Let mixture simmer briefly and then remove from heat. Stir in paprika, lime juice, and cilantro. Taste and season with salt and pepper as needed. To serve, divide corn mixture among four plates. Top each plate with a fish fillet and a squeeze of lime.